Amoxapine (pronounced: a-mox-a-peen. Notable brand names include: Asendin, Asendis, Defanyl, Demolox. See here for more brand name information) is a tetracyclic antidepressant of the dibenzoxazepine family, though it is often classified as a secondary amine tricyclic antidepressant. It is the N-demethylated metabolite of loxapine. It first received marketing approval in the US in 1992 (approximately thirty to forty years after most of the other tricyclic antidepressants were introduced in the US). Amoxapine is used in the treatment of major depressive disorder. Compared to other antidepressants it is believed to have a faster onset of action, with therapeutic effects seen within four to seven days. In excess of 80% of patients that do respond to amoxapine are reported to respond within a fortnight of the beginning of treatment. It also has properties similar to those of the atypical antipsychotics, and may behave as one and may be used in the treatment of schizophrenia off-label. Despite its apparent lack of extrapyramidal side effects in patients with schizophrenia it has been found to exacerbate motor symptoms in patients with Parkinson's disease psychosis. Vasculitis a disorder where blood vessels are destroyed by inflammation. Can be life-threatening if it affects the right blood vessels. Syndrome of inappropriate secretion of antidiuretic hormone (SIADH) this is basically when the body's level of the hormone, antidiuretic hormone, which regulates the conservation of water and the restriction of blood vessels, is elevated. This is potentially fatal as it can cause electrolyte abnormalities including hyponatraemia (low blood sodium), hypokalaemia (low blood potassium) and hypocalcaemia (low blood calcium) which can be life-threatening. Agranulocytosis a drop in white blood cell counts. The white blood cells are the cells of the immune system that fight off foreign invaders. Hence agranulocytosis leaves an individual open to life-threatening infections. Leukopaenia the same as agranulocytosis but less severe. Tardive dyskinesia a most often irreversible neurologic reaction to antidopaminergic treatment, characterised by involuntary movements of facial muscles, tongue, lips, and other muscles. It develops most often only after prolonged (months, years or even decades) exposure to antidopaminergics. Extrapyramidal side effects. Motor symptoms such as tremor, parkinsonism, involuntary movements, reduced ability to move one's voluntary muscles, etc. Thrombocytopenia a significant drop in platelet count that leaves one open to life-threatening bleeds. Eosinophilia an elevated level of the eosinophils of the body. Eosinophils are the type of immune cell that's job is to fight off parasitic invaders. Jaundice yellowing of the skin, eyes and mucous membranes due to an impaired ability of the body to clear the by product of haem breakdown, bilirubin, most often the result of liver damage as it is the liver's responsibility to clear bilirubin. It tends to produce less anticholinergic effects, sedation and weight gain than some of the earlier tricyclic antidepressants (e.g. amitriptyline, clomipramine, doxepin, imipramine and trimipramine). It may also be less cardiotoxic than its predecessors. It is considered particularly toxic in overdose, with a high rate of renal failure (which usually takes 2–5 days), rhabdomyolysis, coma, seizures and even status epilepticus. Some believe it to be less cardiotoxic than other tricyclic antidepressants in overdose, although reports of cardiotoxic overdoses have been made. Amoxapine possesses a wide array of pharmacological effects. It is a moderate and strong reuptake inhibitor of serotonin and norepinephrine, respectively, and binds to the 5-HT2A, 5-HT2B, 5-HT2C, 5-HT3, 5-HT6, 5-HT7, D2, α1-adrenergic, D3, D4, and H1 receptors with varying but significant affinity, where it acts as an antagonist (or inverse agonist depending on the receptor in question) at all sites. It has weak but negligible affinity for the dopamine transporter and the 5-HT1A, 5-HT1B, D1, α2-adrenergic, H4, mACh, and GABAA receptors, and no affinity for the β-adrenergic receptors or the allosteric benzodiazepine site on the GABAA receptor. Amoxapine is also a weak GlyT2 blocker, as well as a weak (Ki = 2.5 μM, EC50 = 0.98 μM) δ-opioid receptor partial agonist. 7-Hydroxyamoxapine, a major active metabolite of amoxapine, is a more potent dopamine receptor antagonist and contributes to its neuroleptic efficacy, whereas 8-hydroxyamoxapine is a norepinephrine reuptake inhibitor but a stronger serotonin reuptake inhibitor and helps to balance amoxapine's ratio of serotonin to norepinephrine transporter blockade. The data in the following table from obtained from the PDSP Ki database. 8-hydroxyamoxapine 30 5.3 (single dosing) 158-512 ng/mL (divided dosing), 143-593 ng/mL (single dose) ? ? ? 7-hydroxyamoxapine 6.5 2.6-5.4 (single dosing) ? ? ? ? - t1/2 is the elimination half life of the compound. - tmax is the time to peak plasma levels after oral administration of amoxapine. - CSS is the steady state plasma concentration. - protein binding is the extent of plasma protein binding. - Vd is the volume of distribution of the compound. ^ a b c d e f g h i j k "Asendin, (amoxapine) dosing, indications, interactions, adverse effects, and more". Medscape Reference. WebMD. Retrieved 26 November 2013. ^ a b Kinney, JL; Evans, RL (September–October 1982). "Evaluation of amoxapine". Clinical Pharmacy 1 (5): 417–24. ^ a b c "Amoxapine: Indications, Side Effects, Warnings -Drugs.com". Drugs.com. Drugs.com. 6 November 2013. Retrieved 26 November 2013. ^ a b c d Amoxapine. Martindale: The Complete Drug Reference (London, UK: Pharmaceutical Press). 30 January 2013. Retrieved 26 November 2013. ^ Ban, TA; Fujimori, M; Petrie, WM; Ragheb, M; Wilson, WH (1982). "Systematic studies with amoxapine, a new antidepressant". International Pharmacopsychiatry 17 (1): 18–27. ^ Product Information: Asendin(R), amoxapine tablets. Physicians' Desk Reference (electronic version), MICROMEDEX, Inc, Englewood, CO, USA, 1999. ^ a b Cohen, BM; Harris, PQ; Altesman, RI; Cole, JO (September 1982). "Amoxapine: neuroleptic as well as antidepressant?". The American Journal of Psychiatry 139 (9): 1165–7. ^ Kapur, S; Cho, R; Jones, C; McKay, G; Zipursky, RB (May 1999). "Is amoxapine an atypical antipsychotic? positron-emission tomography investigation of its dopamine2 and serotonin2 occupancy". Biological Psychiatry 45 (9): 1217–1220. ^ Wadenberg, M-LG; Sills, TL; Fletcher, PJ; Kapur, S (April 2000). "Antipsychoticlike effects of amoxapine, without catalepsy, using the prepulse inhibition of the acoustic startle reflex test in rats". Biological Psychiatry 47 (7): 670–676. ^ Apiquian, R; Fresan, A; Ulloa, RE; de la Fuente-Sandoval, C; Herrera-Estrella, M; Vazquez, A; Nicolini, H; Kapur, S (December 2005). "Amoxapine as an atypical antipsychotic: a comparative study vs risperidone". Neuropsychopharmacology 30 (12): 2236–2244. ^ Chaudhry, IB; Husain, N; Khan, S; Badshah, S; Deakin, B; Kapur, S (December 2007). "Amoxapine as an Antipsychotic: Comparative Study Versus Haloperidol". Journal of Clinical Psychopharmacology 27 (6): 575–581. ^ Sa, DS; Kapur, S; Lang, AE (July–August 2001). "Amoxapine Shows an Antipsychotic Effect but Worsens Motor Function in Patients with Parkinson’s Disease and Psychosis". Clinical Neuropharmacology 24 (4): 242–244. ^ a b "AMOXAPINE TABLET [WATSON LABORATORIES, INC.]". DailyMed. Watson Laboratories, Inc. July 2010. Retrieved 26 November 2013. ^ "Side effects of antidepressant medications". UpToDate. Wolters Kluwer Health. Retrieved 26 November 2013. ^ a b Walker, R; Whittlesea, C, ed. (2007) . Clinical Pharmacy and Therapeutics (4th ed.). Edinburgh: Churchill Livingstone Elsevier. ^ Gelenberg, AJ; Cooper, DS; Doller, JC; Maloof, F (October 1979). "Galactorrhea and Hyperprolactinemia Associated With Amoxapine Therapy". JAMA 242 (17): 1900–1901. ^ White, N; Litovitz, T; Clancy, C (December 2008). "Suicidal antidepressant overdoses: a comparative analysis by antidepressant type" (PDF). Journal of Medical Toxicology 4 (4): 238–250. ^ Tatsumi M, Groshan K, Blakely RD, Richelson E (December 1997). "Pharmacological profile of antidepressants and related compounds at human monoamine transporters". European Journal of Pharmacology 340 (2–3): 249–58. ^ a b Pälvimäki EP, Roth BL, Majasuo H; et al. (August 1996). 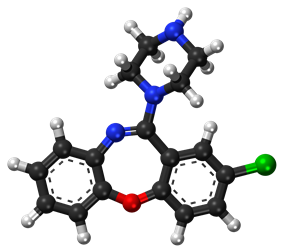 "Interactions of selective serotonin reuptake inhibitors with the serotonin 5-HT2c receptor". Psychopharmacology 126 (3): 234–40. ^ Glusa E, Pertz HH (June 2000). "Further evidence that 5-HT-induced relaxation of pig pulmonary artery is mediated by endothelial 5-HT2B receptors". ^ a b c Gozlan H, Saddiki-Traki F, Merahi N, Laguzzi R, Hamon M (December 1991). "[Preclinical pharmacology of amoxapine and amitriptyline. Implications of serotoninergic and opiodergic systems in their central effect in rats]". L'Encéphale (in French). 17 Spec No 3: 415–22. ^ a b Roth BL, Craigo SC, Choudhary MS; et al. (March 1994). "Binding of typical and atypical antipsychotic agents to 5-hydroxytryptamine-6 and 5-hydroxytryptamine-7 receptors". The Journal of Pharmacology and Experimental Therapeutics 268 (3): 1403–10. ^ a b c d e Richelson E, Nelson A (July 1984). "Antagonism by antidepressants of neurotransmitter receptors of normal human brain in vitro". The Journal of Pharmacology and Experimental Therapeutics 230 (1): 94–102. ^ a b Burstein ES, Ma J, Wong S; et al. (December 2005). "Intrinsic efficacy of antipsychotics at human D2, D3, and D4 dopamine receptors: identification of the clozapine metabolite N-desmethylclozapine as a D2/D3 partial agonist". The Journal of Pharmacology and Experimental Therapeutics 315 (3): 1278–87. ^ Lim HD, van Rijn RM, Ling P, Bakker RA, Thurmond RL, Leurs R (September 2005). "Evaluation of histamine H1-, H2-, and H3-receptor ligands at the human histamine H4 receptor: identification of 4-methylhistamine as the first potent and selective H4 receptor agonist". The Journal of Pharmacology and Experimental Therapeutics 314 (3): 1310–21. ^ Harald Sitte; Michael Freissmuth (2 August 2006). Neurotransmitter Transporters. Springer Science & Business Media. pp. 472–. ^ Onali P, Dedoni S, Olianas MC (January 2010). "Direct agonist activity of tricyclic antidepressants at distinct opioid receptor subtypes". J. Pharmacol. Exp. Ther. 332 (1): 255–65. ^ Midha KK, Hubbard JW, McKay G, Rawson MJ, Hsia D (September 1999). "The role of metabolites in a bioequivalence study II: amoxapine, 7-hydroxyamoxapine, and 8-hydroxyamoxapine". International Journal of Clinical Pharmacology and Therapeutics 37 (9): 428–38. ^ Brunton L, Chabner B, Knollman B. Goodman and Gilman’s The Pharmacological Basis of Therapeutics, Twelfth Edition. McGraw Hill Professional; 2010. ^ a b Jue, SG; Dawson, GW; Brogden, RN (July 1982). "Amoxapine: A Review of its Pharmacology and Efficacy in Depressed States". Drugs 24 (1): 1–23. ^ Calvo, B; García, MJ; Pedraz, JL; Mariño, EL; Domínguez-Gil, A (April 1985). "Pharmacokinetics of amoxapine and its active metabolites". International journal of clinical pharmacology, therapy, and toxicology 23 (4): 180–185. ^ Takeuchi, H; Yokota, S; Shimada, S; Ohtani, Y; Miura, S; Kubo, H (April 1993). "Pharmacokinetics of amoxapine and its active metabolites in healthy subjects". Current Therapeutic Research 53 (4): 427–434. ^ "Amoxapine Monograph for Professionals - Drugs.com". Drugs.com. Bethesda, MD, USA: American Society of Health-System Pharmacists, Inc. 1 October 2007. Retrieved 30 November 2013. ^ "Amoxapine -Drugs.com". Drugs.com. Drugs.com. 2013. Retrieved 26 November 2013.